What's more adorable than a large group of sea otter stuffed animals? It's safe to say that this bunch of plush otters is tops on the cuteness chart! You otter be able to sea that! See what we did there? A sea otter joke. Read more. 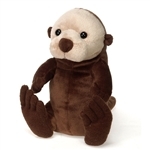 Sea otters love jokes and stuffed sea otters will sit for hours while you work on your new comedy routine. They actually don't have a choice, though. They are filled with super soft stuffing, not muscles and bones. You kind of need those if you are going to get up and walk out on an aspiring comedian. Not that your routine isn't great, we're sure that it is hysterical. It will make people smile as much as a room full of sea otter stuffed animals. That is a lot of smiling. 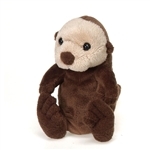 These adorable plush sea otters come in many sizes and even a few different colors. Some of them are holding cute little plush starfish, which we realize is a not incredibly accurate based on a real sea otter's diet, but it sure is adorable. Who is to say that the plush sea otters with starfish aren't just holding them for fun. Maybe they are playing with them. Sea otters love to play. Maybe they are just friends. The world is full of reasons why a sea otter might hang on to a starfish. Maybe the starfish needed a lift from one reef to another. Sea otter stuffed animals, with or without starfish, tend to do as they please. It's all part of their happy and fun personalities. Besides, when you are as cute as these plush sea otters it really doesn't matter what you hold in your paws, people are going to love you! Shop.